Hollywood came to The Cutting Garden in May this year, when our junoir apprentice Hollie wowed the judges at the 2016 GHQ Training ‘Night at the Movies’ Hairshow. One of the most visually challenging categories in the show this year was the Blockbuster section. Hollie represented The Cutting Garden with an absolutely stunning creation based on The Mad Hatter from the film version of ‘Alice in Wonderland’ starring Johnny Depp. By using a card framework she was able to sculpt the model’s hair to create the illusion of a flamboyant top hat. 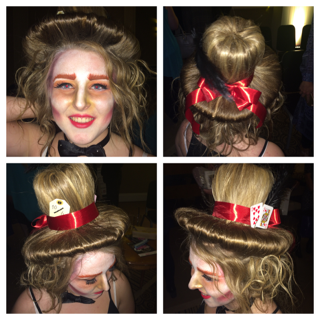 Hollie completed the illusion with skillful use of props such as ribbon and playing cards. Striking make up applied the finishing touches to a truly stunning and deservedly award-winning creation. Hollie’s creativity and skills impressed the judges so much that she was awarded the 1st year prize. You can try the Cutting Garden yourself. See how our experienced stylists look after your crowning glory. Simply call 01752 223233 and book an appointment.